Hello friends, I would like to share one of my wonderful chapter in my university life. Two months ago, several postgraduate students and I joined the TUT-USM Global Summer School Programme (GSSP). I got this offer from one of my friend. I was too excited when I hear “Rahim, are you interested to join a collaborative project with engineering students from a Japanese university?” Without hesitating, I agreed to be the part of this programme although I was unsure of my contribution to this programme. A day after, all of the participants of the GSSP were called for a meeting with Professor Zalina Ismail (a lady who keeps inspiring me since undergraduate studying period) at BRAINetwork. During the meeting, Professor Zalina described the mission and vision of this programme. The ultimate concern of this GSSP was to improve the lifestyles of indigenous people in Banding Island through contribution via academic bridging with USM and TUT students. Although I was uncertain of my contribution in actualizing the aim of this project but I took this opportunity as a platform to involve myself with this project. Eventually, all of us agreed to join this noble project as it will be a great exposure for all of us. A series of meeting were held with Professor Zalina for brainstorming and discussion purposes. Meanwhile, we also created an account in Facebook in order to communicate with TUT students before the programme commenced. This GSSP seemed to be the first project of this kind to be conducted by these two prestigious universities .We were understood that GSSP was carried out by Univeristi Sains Malaysia (USM) with a collaboration of Toyohashi University of Technology (TUT) for the period of two weeks (7/9/2014 – 21/9/2014). This entire GSSP was co-organised by the Centre for International Education on behalf of TUT while BRAINetwork Centre for Neurocognitive Sciences [BRAINetwork], School of Health Sciences, on behalf of USM. Basically, this programme consisted of three phases: Pre Summer, Summer and Post Summer School. The involvements of the students are mainly in Summer School Phase, hence, this programme was named as Global Summer School Programme. This GSSP (Summer School Phase) is further divided into three phases: Ice breaking phase (USM-Kubang Kerian), Data collection/assessment phase (Banding Island) and lastly data interpretation/proposal phase (USM-Main Campus). Basically, seven postgraduate students from TUT were paired with seven postgraduate students from USM. The pairs were required to collect the data at various villages of Indigenous community. At the third phase of this GSSP, each pair required to come up with a project that may implemented in the village which expected to improve and contribute to the development of the indigenous people in Banding Island bioregion. Rahim and Naoki, hitting it off from the start! 7th September 2014, the time for the Summer School was upon us, we picked up our Japanese friends from the Pengakalan Chepa Airport, Kelantan. We brought them to HolidayVilla Hotel which was located half an hour from the airport. As soon they reached the hotel, the Japanese students shook hand with us with “Apa Khabar?”. All of us astonished with their efforts and it was so sweet of them to learn some of our basic daily dialogues. Besides that, we USM students also took some initiative to learn some basic Japanese phrases such as “Konichiwa” and “Ohayo Kozaimas”. I think they were amazed as well. This definitely proved to us that language and culture is no barrier if you really want to get close with someone who is not from the same background as yours.We had our dinner at Hotel HolidayVilla with our new Japanese friends and we got to know each other more. Another important event that carried out in this first phase was the TUT-USM cultural night. The whole night filled up with multiethnic performances as Malaysia is rich with potpourri of cultures. It was an honor for me to perform an Indian folk dance together with my co-dancers Parimalah and Tinageshwari. Tinageshwari choreographed the Indian dance and we took almost two weeks to practice the entire dance. Besides that, my friend Zulhusni together with his friends, performed few Nasyid songs (Islamic songs) and a lion dance was also performed and that was one of the highlight on the night. Interestingly, the Japanese students also came up with few culture sharing activity; it was calligraphy. They demonstrated and taught us how to write Japanese calligraphy. In fact, they wrote our names in Japanese and gave them to us as a souvenir. Although everyone was tired with the cultural night, we still able to put some smiles and snapped lots of pictures with our Japanese friends. It was a fantabulous day for all of us. 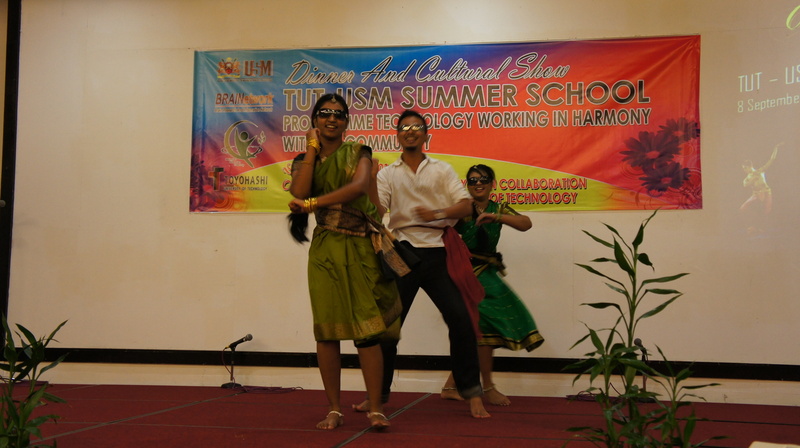 Rahim, Parimalah and Tinageshwari’s energetic performance in action! More on Rahim’s thoughts on the summer school programme as phase two brought him to the Belum-Temenggor Forest Reserve to perform the Community Sustainability Assessment, before going to Penang in phase three, to work with his partner Naoki, to come up with a sustainable solution that would meet one of the needs of the Orang Asal communities that they just visited .